One of the things that are so rewarding about this website is the ability to compile data over a long time period and present it in a way that has so far not being available to collectors, either in book form or online. Online auctions were fine as a vehicle for purely selling watches, but their transient nature, with items being live for only seven or ten days and then gradually disappearing from view altogether, meant that these weren’t the ideal medium for permanently displaying a lot of researched material. Here, it should be possible to identify a subject and create a pool of knowledge relating to it, forming a lasting record that enthusiasts can keep returning back to whenever they wish. The stamps to be found inside Rolex case backs have always fascinated collectors, not least because there is a definable progression to them, but also because of the number of inconsistencies and overlapping stamps in circulation that shouldn’t theoretically exist. As far as we are aware, nobody has ever tried to put these into strict chronological sequence before, so this exercise is venturing into uncharted territory. Hopefully, it should be useful as an aid to weeding out those watches that have wildly different case back markings to others from the same year, this suggesting that they merit further scrutiny to confirm their originality. It seems most logical to structure this section so that the chart itself is accessible with a minimum number of clicks in order that returning browsers can refer back to it in the most direct fashion. To give a little bit of background detail, the original Rolex case back signature was “W & D”. If we want to be deliberately pedantic, this isn’t technically a Rolex stamp because the Rolex trade name hadn’t even been conceived at the time of its first use. However, it is the first form of case back marking used by the company that would go on to become Rolex, hence it makes a logical point at which to begin this research. The W & D letters represent the surnames of Hans Wilsdorf and his business partner, and brother in law, Alfred Davis. Founded in 1905, this partnership traded on a relatively small scale from premises initially in London’s Hatton Garden, importing movements from the Aegler company in Switzerland and housing them in British made cases. When it was obvious that there was going to be war with Germany, the two partners realised that it wasn’t going to be commercially advantageous to have the German sounding name “Wilsdorf” in their business title. Wilsdorf had come up with the word Rolex quite some time before but in November 1915, the two officially changed their trading style to “The Rolex Watch Company Limited”. Presumably to avoid confusion among their existing customers, the new company then went through quite a long stage of having both Rolex and W & D stamped dually into its case backs. When more additions to the accompanying chart have been made, we should get a fairly definitive record of when the W & D stamp was finally laid to rest and only the Rolex name stated on its own, but provisionally, it seems likely that this phasing out began in around 1918 and was all but completed by mid-1920. The next era of vintage Rolex case back stamping is the most relevant to the project being undertaken here. In the early 1920s, Rolex introduced a new case back signature on which the number of world records set by the company in accuracy competitions was stated below the Rolex brand name. When it first appeared, 7 world’s records were stated, with this number gradually rising to, we think, 41, just before the close of World War II. In our business, we have long believed that if this rising number was accurately charted by year, it would be a useful dating aid that could be of assistance to the collector in instances when other means of identifying a specific year of production, i.e. case serial number and British hallmark date letter, were, for whatever reason, not available. Similarly with early Rolex Oyster cases, there should be a pattern of increasing patent numbers mentioned as the years go on. Later, the mention of patents by number and individual country would be dropped but even so, Rolex gradually evolved its case back stamps and it should be possible to pick out some sort of trends. In the early 1950s, a system of date stamping was introduced for Oyster cases, with the quarter of the year in which the watch was produced indicated by a Roman numeral, after which the last two digits of the year were given in Arabic numerals. So, for instance, II.53 would tell us that the watch was manufactured in the second quarter of 1953. Again, hopefully the process of recording case back stamps in this way should allow us to spot any other variations that exist from this period. It will seem rather strange to the casual browser that there are relatively few case back stamps pictured initially, especially when we have a large number of vintage Rolex models for sale and well over a thousand more that are here in stock, but which haven’t yet been catalogued for presentation online due to enormous amount of time needed to write suitable descriptions for each. 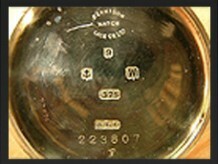 The reason for this is that in order to create a meaningful table that is entirely accurate with no percentage of error, we decided to include as source material only those watches on which the date of either assay or retail sale could be identified categorically, either from, in the first instance, a clear British hallmark date letter or, in the second, original receipt or guarantee paperwork that was supplied with the watch when new. In other words, if we have a watch in front of us that is without a UK hallmark and doesn’t have its original sales paperwork from new, because its exact date can never be pinpointed without a margin for error, even if we feel that we can gauge its age very precisely from its specification and serial number, we will not include its case back markings in this chart. By being extremely strict in the criteria required to gain inclusion, we should hopefully produce the definitive visual guide to vintage Rolex case back stamps from the pre-World War I era right through to the 1980s. As time allows and indeed, as new watches are sourced for stock, we will photograph their case back markings and add them to the table here. Rolex and W & D both stamped in tandem, together with Swiss. Case maker is Dennison, of Birmingham UK. The ALD letters are the initials of Aaron Luftkin Dennison, the company's founder. Men’s gold tonneau shaped. Wire lugs. Rebberg movement. Case number 42439. W&D stamp only. No mention of Rolex. Late use of this early stamp on its own. Ladies’ gold circular model with tonneau shaped bezel. Rebberg movement. Model reference 0322. Case number 12557. RWC Ltd cartouche. Rolex 7 World's Records. Gold Medal. Geneva-Suisse. Early use of World's Records stamp. Men’s gold tonneau. Flat pressed lugs. Model reference 2006. Case number 837540. Men’s gold cushion shape. Model reference 2008. Case number 15296. Men’s gold cushion with circular snap back. Pressed flat lugs. Hunter movement. Model reference 620, though this is the case maker’s reference rather than that of Rolex. RWC Ltd cartouche. No case maker's mark, but almost certainly a housing manufactured for Rolex in the UK. Tonneau shaped gold ladies’ model. Model reference 2622. Case number 18675. Rolex 25 World's Records, Geneva, Suisse. RWC Ltd cartouche used. Case maker Union Suisse des Fabricants de Boites de Montres ( USFB). Men’s gold cushion shaped Oyster. Hand wound Hunter movement. Model reference 2420. Case number 35438. Men’s gold hand wound Oyster. Cushion shaped, three piece case. Hunter movement. Model reference 2941. Case number 39460. Large coronet logo on case back outer. Men’s gold tonneau with circular snap back. Pressed flat lugs. Hunter movement. UK case maker’s model reference 1245. RWC Ltd cartouche. No case maker's mark shown, but clearly of UK origin. Men’s gold flat sided officer’s watch with hinged lugs. Rebberg movement. Case number 101755. RWC Ltd cartouche. Case maker Bahler A & Fils. Hallmark year seems too late for this early style of watch, suggesting that it was imported to the UK many years after manufacture. Men’s gold Oyster, hand wound. Model reference 2574. Case number 40645. Oyster Watch Co, Geneva-Swiss, Great Britain Patents, Swiss Patents, French Patents, USA Patents, German Patents. RWC Ltd cartouche used. Case maker Union Suisse des Fabricants de Boites de Montres ( USFB). Men’s hand wound gold. Model reference 7066. No seperate case back, with body, case and lugs all integrated. Large coronet emblem. Rolex. R.W.C but no cartouche. Case maker British Watch Case Company.